St. Peter’s Church was founded in 1764, with the original building constructed in 1767. The site for the first church was purchase d f r om Joseph Davis on Governor’s Hill Road. By 1834 the old church was torn down as it was badly in need of repair and was probably too small for the growing congregation. 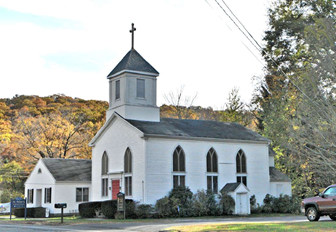 The present church was consecrated during the autumn of 1835 on land located on the west side of Oxford Road in the center of town. Chauncey Hatch donated the site for the new building at what is now 421 Oxford Road. The “new” church follows a Gothic architectural de- sign, with a tower ten feet square and twenty feet above the intersection of the roof. The tower includes a belfry and louvered windows which have been recently replaced. In 1964, a new parish hall was completed and connected to the main building.